I hadn't heard good things about Disney's The Nutcracker and the Four Realms, but like all good critics, I tried to set any preconceived biases aside and give this one an honest review. And you had me Disney, you had me for a good 15 to 20 minutes...and then it all fell apart. No, The Nutcracker isn't a very good movie, and that's a shame because it starts out doing things right, but can't seem to help itself once the movie dives into its magical land that is pretty much all expensive sets and CGI, with not an interesting storyline to be found. But let's jump back to the beginning. Mackenzie Foy stars as Clara Stahlbaum, the middle child in a family of three, with only one parent, her father (Matthew Mcfadyen), as their mother has passed on. It's Christmas in London, and the first the family has been without Mrs. Stahlbaum. She's left Christmas presents for her three children, and Clara has received a metal egg with a keyhole but without a key to open it. She takes the egg to a Christmas party/ball hosted by her godfather, Drosselmeyer (Morgan Freeman), hoping he can unlock it for her...but he's got more in mind for Clara. He announces it's time for the children in attendance to get their Christmas gifts, and they have to find a string with their name on it and follow its path through the large home until they find their presents on the other end. Clara's string leads her through a dark passage and out the other end of a huge tree trunk into the land of the Four Realms. This opening will no doubt bring back memories of the stories of The Wizard of Oz or Disney's own film versions of Alice in Wonderland and The Lion, the Witch, and the Wardrobe, and I was just as engaged with this movie as I was the first time I saw those other films. However, it's all downhill from here, sadly, as not much of what Clara discovers in this new world is of much interest, nor does her quest to open the egg lead to anything particularly exciting other than a moment of self-realization. 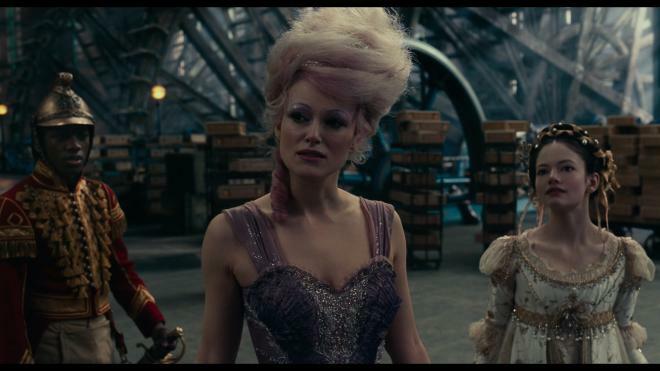 Clara meets up with a nutcracker soldier named Phillip (Jayden Fowora-Knight), who takes Clara to a huge palace, where she meets the three leaders of the other three lands, the primary one of which is the Sugar Plum Fairy (Keira Knightley). The fourth land, which is the Fourth Realm of the movie's title, is run by the mysterious Mother Ginger (Helen Mirren) and an army of mice (one of which has the key to open Clara's egg). Of course, things aren't quite what they seem at first, although any good Disney aficionado should know that mice are never, ever evil in a Disney film. The remainder of the movie seems like an excuse to show off the film's elaborate set pieces and the enormous amount of budget that was sunk into CGI, as it's both overused and fairly obvious (although not poorly done) throughout. While Foy, Fowora-Knight, and Mirren are all fine with their performances, Knightley is so cringe-inducingly bad that her representation should have demanded her name be taken off this picture. I'm sure she had fun playing it over-the-top the way she does, but the tone just clashes with almost every other character. There are also moments in the movie that just make you wonder, "What were they thinking?" For example, about halfway through, the story comes to a grinding halt for an extended ballet sequence featuring dancer Misty Copeland. Yes, I realize this is to try and make the movie a little more similar to The Nutcracker ballet upon which it is ever-so-loosely based, but – wow – talk about a momentum killer. There's also this annoying (and downright bizarre) group of clowns that work for Mother Ginger that look like they'd be more comfortable in a Tim Burton movie. They're supposed to be comic relief. They're more likely to give the young ones (and maybe a few adults) nightmares. I could go on and on about all the problems with this film, but the above is just a taste of its many problems. It's a shame because it's obvious in almost every frame that Disney spend a boatload of cash on this movie (numerous online sites report somewhere in the neighborhood of $120 million). They might have taken some of that cash and hired a script doctor or two. We've all heard, "If it's not on the page, it's not on the stage." The Nutcracker and the Four Realms is proof positive of that old saying. 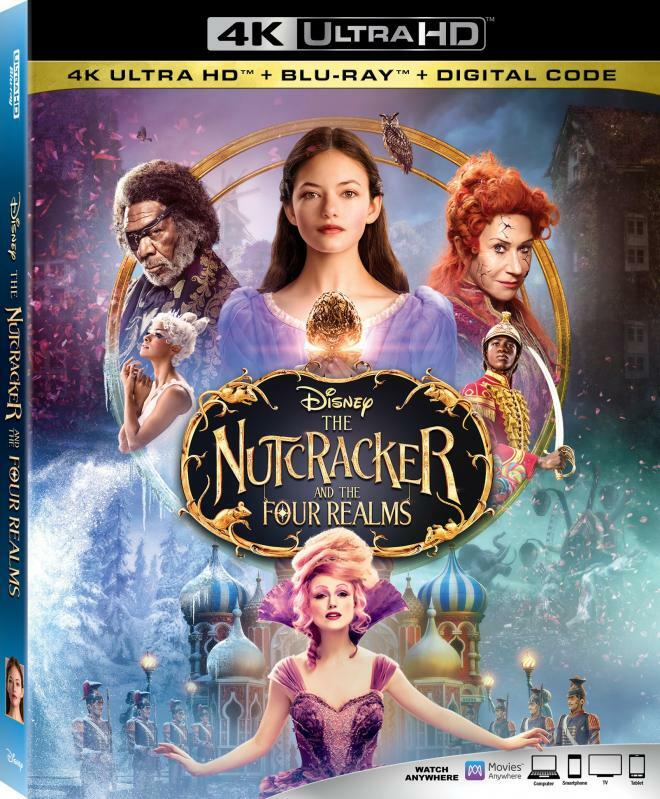 The Nutcracker and the Four Realms arrives on 4K with the UHD and 50GB dual-layer Blu-ray housed inside a black standard Elite keepcase. There are two inserts inside: one with a code for a digital copy of the movie (the same code can be used for Disney Movie Rewards program), and one advertising Disney's Movie Club (think Columbia House with DVDs/Blu-rays instead of CDs). An embossed slipcover with artwork matching that of the keepcase slides overtop. The slipcover has those rounded corners which match the majority of other UHD releases. Both discs have the user make a language selection (English, English Descriptive Audio, French, or Spanish) once play begins. There are no front-loaded trailers on the UHD disc; however, the Blu-ray has a (skippable) trailer for Disney's upcoming live-action Dumbo. The main menu on both discs features a montage of footage from the film, with menu selections vertically down the left side of the screen. The Blu-ray in this release is region-free, while the 4K disc, of course, has no region coding. 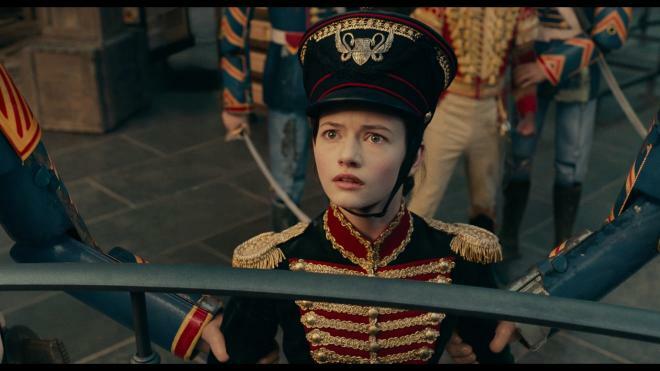 The Nutcracker and the Four Realms was shot on 35mm film using (primarily) the Arriflex 235 and is presented in 4K in its original theatrical aspect ratio of 1.85:1 from a 2K digital intermediate. That means the image here is upscaled, but most viewers won't be able to tell the difference. Although I had a lot of problems with the story, the 4K version of the movie is a feast for the eyes. Virtually all colors you can imagine are used somewhere in the movie. The scenes in London lean heavily into teals (intentional, according to the bonus materials on this release – to avoid the reds and greens usually associated with Christmas movies), while lush reds are prominent in both the outfits of the Nutcracker guards as well as the main castle in the Fourth Realm. Whites are bright without being blown-out, and black levels are inky deep. Although the movie is not encoded with Dolby Vision, the HDR boost it gives everything a deeper, more textured look over the Blu-ray counterpart (although the Blu-ray looks great for a 1080p presentation). The movie also manages to maintain the look of film in the process. Grain is evident, but never intrusive – which is exactly what you want from a film transfer. And despite all the various colors, many of them occupying the same scenes and frames in often fast-moving action, I never detected any bleeding of the colors, haloing, banding, aliasing, or other issues with the image. Short of "true" 4K, this is among the best you'll see when it comes to upscaling a 2K digital intermediate. 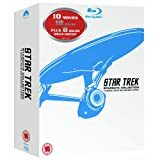 The featured audio on the 4K disc is an English Dolby Atmos track that, while not quite reference-quality, does have some impressive highlights. First of all, like most Disney home video audio mixes, you'll need to crank up the volume a few levels higher than most of your other non-Disney discs. Still, despite being mixed lower than most releases, the Atmos adds a level of fun to an otherwise lackluster movie. There are, of course, the big booming moments. I particularly liked a scene where a horde of mice gather together to form a giant monster mouse (Atmos provides some overhead enhancement here). But it's really the distinct moments I enjoyed the most, like when one of the mice (who has in its possession a key that Clara has been looking for) scampers across the snow. Not only do the surrounds come into play with some nice aural movement, but you can pick up on how distinct the sounds are here – separation is well done and both the low ends and the high ends are well-rendered. Dialogue is clear throughout, and I detected no noticeable glitches overall. This is one of those tracks where both the loud moments and the quieter moments both deliver. Again, it's not the best Atmos track I've heard, but it does a great job with the presentation. In addition to the Atmos track, the 4K disc also has an English 2.0 Descriptive track, a Spanish 7.1 Dolby Digital Plus track, and a French 5.1 Dolby Digital track. Subtitles are an option in English SDH, French, and Spanish. On Pointe: A Conversation with Misty Copeland (HD 4:36) – Ballet dancer Misty Copeland, who has an extended dance sequence smack dab in the middle of the movie talks about her experience working on the film. Unwrapping The Nutcracker and the Four Realms (HD 7:08) – This is a standard behind-the-scenes look at the making of the movie, with comments from Production Designer Guy Hendrix Dyas, Set Decorator Lisa Chugg, Costume Designer Jenny Beavan, and stars Mackenzie Foy, Keira Knightley, Helen Mirren, and Misty Copeland. Deleted Scenes (HD 4:05) – A collection of deleted scenes, consisting of: "The Stahlbaums Arrive" (0:25), "Follow Your Ribbon" (0:44), "Clara Asks About Her Mother" (1:43), "Left, Left, Left, Left, Left" (0:51), and "Out with the Old" (0:13). Each of these scenes can be watched individually or all together. "Fall on Me" Music Video (HD 4:23) – The first of two music videos on this release, this one performed by Andrea Bocelli and featuring Matteo Bocelli. "The Nutcracker Suite" Music Video (HD 4:06) – This second music video is performed by Chinese pianist Lang Lang. From a A/V standpoint, Disney's The Nutcracker and the Four Realms looks and sounds great. The problem is that the story's is just not very good or engaging, and downright bizarre at times. Add to that a so-so selection of bonus materials, and this release is just not worth your time. Skip It.